Hi everyone! Just a quick little update as I'm still in the midst of having some other stuff happening and won't be back here full time for a while yet. 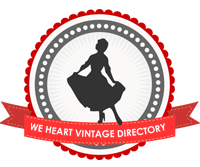 Last month I was contacted by Feedspot to let me know that Lovebirds Vintage is of the top 10 UK vintage fashion blogs, based on a number of criteria including influence on social media and quality of posts. While I'm not quite sure how I managed this as I constantly feel like really small fry in the blogging world, I'm very grateful to Feedspot for including me and of course to all my readers for supporting me throughout the time I've been blogging. You can find the complete top 10 list including more details about selection criteria and some stats on Lovebirds Vintage here.